A user in the MCP SBS Forum had an interesting question which I thought I would share with you. They were looking for a way to have an e-mail address shared by all the users. My solution to this problem is Outlook Public Folders. If you have never used Public Folders they are really quite easy to create. 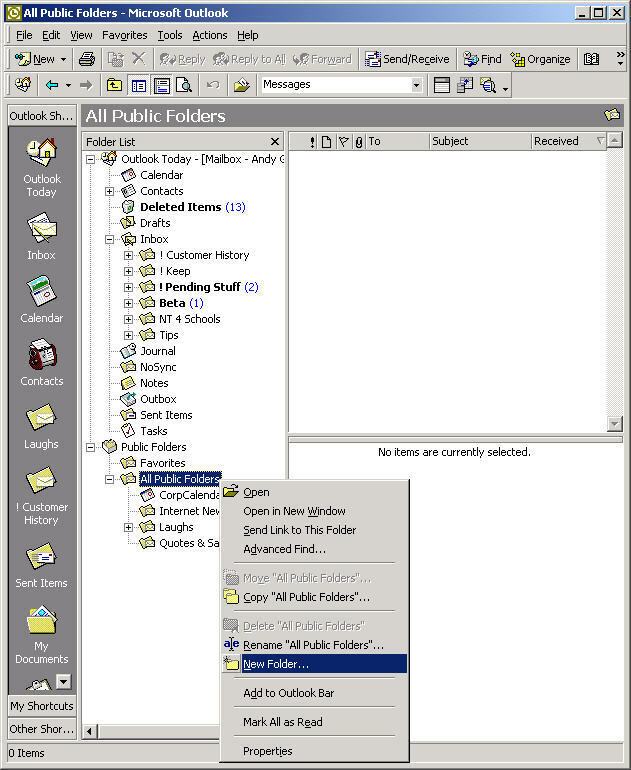 You create a public folder by right clicking on "All Pubic Folders" and then "New Folder"
It will automatically create an e-mail address for the folder which will be the name of the folder. So if your domain is company.com and you created a public folder called Test1 the address would be test1@company.com. Any mail sent to test1@company.com would go into the public folder and be visible by all the users. This will keep it from getting lost in their inboxes with all the rest of their mail. *All trademarks and copyrights are property of their respective owners.